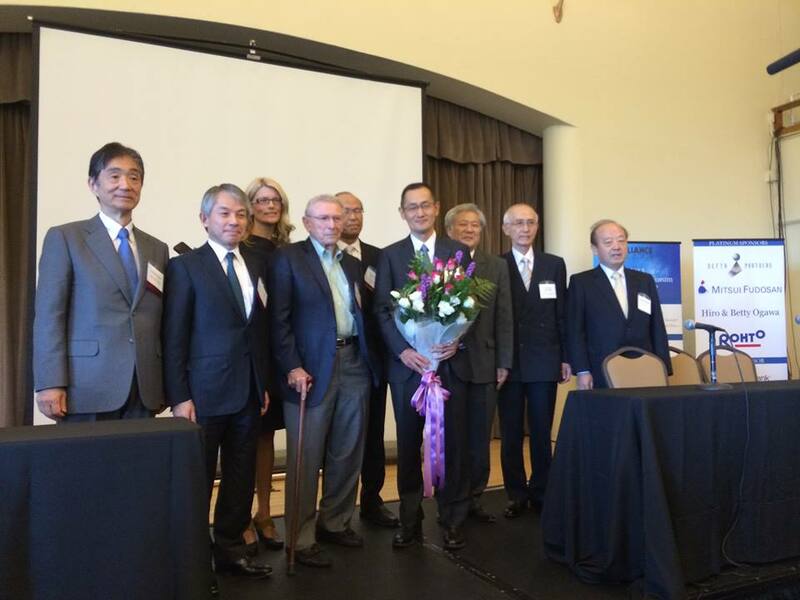 The World Alliance Forum held a really great meeting yesterday in SF about the future of stem cells. The collective brain power in the room was pretty staggering. The meeting brought together stem cell leaders from academia, industry, startup incubators and funding agencies. The purpose of the meeting was three fold: 1.) foster collaboration between US and Japanese stem cell researchers, 2.) facilitate interaction between academics and industry, and 3.) to honor Dr. Shinya Yamanaka for his grounding breaking iPSC work that won him the Nobel Prize last year (see photo from Cell Stem Cell post on Facebook). Yamanaka gave a great keynote address that showcased his sense of humor and his continuing efforts to bring iPSC technology to the clinic (including developing needed homozygous HLA iPSC lines). When asked for his advice to ambitious young researchers, he recommended paying close attention to unexpected results in the lab. After all, he noted, the seed of his iPSC research came when he got confusing results from a potential cholesterol lowering drug that induced liver cancer in mice. Aside from the great talks by some of the leaders in the field (Irving Wiessman, Hideyuki Okano, Deepak Srivastava, Mahendra Rao, Hiromitsu Nakauchi), there were a couple of outstanding panel discussions including one covering the future of stem cell technology that was moderated by Alan Trouson, president of CIRM. While another discussed academia and industry collaboration moderated by Regis Kelly of startup incubator QB3. One of the take home messages was that translational academics need to start engaging industry earlier on. There was also some sage advice from industry representatives indicating that academics thinking about developing startups really need to reach a significant level of maturity before spinning off in search of VC funding. As the sun started to set over the bay and the jazz music and wine started to flow in the reception hall, it was hard not to be struck by a couple of ideas. One, we’re incredibly lucky here in California to have CIRM and strong patient advocacy organizations that help bridge the often lamented translational funding gap. Both of these groups have really been enormously helpful in bringing potential new stem cell therapeutics to the clinical trial pipeline. Second, hearing all of these great discussions really gave a taste of the zeitgeist of the field and although there is still a lot of work yet to be done, it’s hard not to be really excited about the future of stem cell technology as it draws closer and closer to the clinic. I’d like to really thank Dr. Knoepfler for allowing me to attend this meeting and blog about it. It was incredibly informative and I was even lucky enough to expand my network a bit. I really hope there will be future meetings that bring together all of the major stake holders the way the World Alliance Forum was just able to do. Regis Kelly of startup incubator QB3. You mentioned The purpose of the meeting was three fold: all good points. Unfortunately there is also a fourth-fold which looms ahead in the shadows – that is, the impending war against “Big Pharma” and “Big Disease” – whose combined annual income from “stemcell-treatable” disease probably amounts to several $100 billion per-year. I fully expect these two joined-at-the-hip entities to put every conceivable roadblock in the way of stem cell’s future. As one who is diagnosed with a rare Primary Immunodeficiency disorder, I hope I live long enough for stem-cells give my life some semblance of normality, however, I expect stemcell developments (ie. Yamanaka’s “unexpected results in the lab”) to far outpace approval from the powers-that-be. BTW: I am currently reading Paul’s book which arrived by FED-Ex late last week. What is your evidence of this impending war and conspiracy to roadblock stem cells? I haven’t seen anything to suggest that is really happening. I’m no fan of Big Pharma and I am a big fan of stem cells so if this is really happening I’d like to see the proof. If anything it seems like Big Pharma is getting more interested in stem cells itself. Some Big Pharma companies have their own stem cell programs in addition to traditional pill drug production. You caught me speculating and saw my cynical side as well. Don’t get me wrong, I am enthusiastic as can be with the stem cell news which I see on a daily basis. I was particularly pleased to see the article last week – I think in New Scientist – that successful stem cell treatment in Severe Combined Immunodeficiency (“Bubble-Boy” Disease) had re-invigorated the industry. My enthusiasm, however, is tempered with realism. Whenever the establishment has too much to lose, roadblocks and barriers are erected. Disease, standard treatments, pharmaceuticals, and the like, are well-entrenched money-makers. Having millions of people with chronic illness and disease is immensely profitable. A one-time cure of a sick individual has the capacity to wipe away the potential of that person as a consumer of expensive medical services. On a grand-scale, it would be “disastrous” for the status-quo. I guess the best parallel I can come up with is “Big Oil.” We hear at the beginning of every administration, and during each election-cycle, that it’s time for alternative fuels and to cut our dependency on fossil fuels. Then lobbyists take over. Projects are blocked. Tariffs are put in place. The wheels of progress slow down…or worse, grind to a halt. There are simply too many powerful individuals and companies with too much to lose. I sincerely hope that stem cell therapy will offer cure as an alternative to treatment. You are right that I have no proof of the impending battle between Big Pharma and stem cell technology. I think looking back at history is what brings about my cynicism. Maintaining the status-quo is always the better option for those who are in control and for those who have a hand in huge profits. I hope that I am wrong about this. I would love to be proven wrong. Time will tell. I should also add to Johnathon – best of luck with your PhD candidacy and much success with your career aspirations! Lovely article. Collaboration is the key and CIRM is seeking lots of Collaboration with its recent RFAs and Strategic Roadmap for Innovation project.